Whenever I hear "Last Nite," the highest-charting single off the Strokes' 2001 debut, Is This It, I think about the old Honda Civic I used to drive  and also Napster, pre-9/11 airport security and how everyone kept talking about this great new movie Zoolander. The Strokes were everywhere in early 2001. Is This It is 36 catchy minutes of unadorned rock that was recorded in live takes rather than spliced together on a computer  a startling departure from the overproduced, emotional alt-rock that dominated the radio then. At the time, the New York Citybased five-piece were regularly referred to as the next Nirvana. Until they weren't. Is This It struggled to go gold (it was certified platinum last month, nearly 10 years after its release), and the band's two subsequent albums fizzled. Then the Strokes took a break  for five years. Now they're back with a new album, Angles, that just might free them from the past  and everything I imagine when I think about the Strokes. Recorded at guitarist Albert Hammond Jr.'s house in upstate New York, Angles is a 10-song exercise in rock precision. The first single, "Under the Cover of Darkness," is so upbeat that it borders on pop, and "Machu Picchu" uses the same rhythm as Michael Jackson's "Wanna Be Startin' Somethin'". Angles offers a sleeker, peppier version of the Strokes. On some tracks, singer Julian Casablancas tones down his guttural vocals to something more closely resembling a nasal croon. This time they did employ technology: Casablancas recorded remotely and sent digital files to the rest of the band. So what did the Strokes do during their break? They tried to recover from instant, overblown fame, in part. "Everything just took off," says Hammond. "People assumed we were this giant rock band with a private jet, but we weren't." "We got to a point where a lot of us needed time off," says guitarist Nick Valensi, the only member who didn't attempt a side project during what he refers to as "the so-called hiatus." 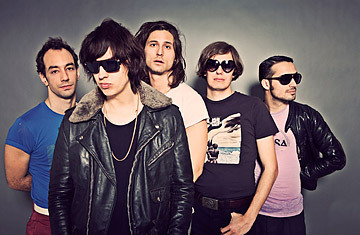 Valensi and Hammond say they're pleased with Angles and that the band is a top priority again. But the Strokes still feel burdened by their moment in the spotlight and are unsure about their legacy. "Ten years have gone by, and what's left?" asks Hammond. "Maybe the fame. But I hope it'll be the music."